22 Jump Street seems like an unnecessary sequel. Then again, 21 Jump Street seemed like an unnecessary movie. This is Chris Miller and Phil Lord’s second outing in 2014 following the huge success of The Lego Movie. As both 21 Jump Street and The Lego Movie proved, they are masters at taking bad ideas and spinning them into gold. 22 Jump Street could also be another great bad idea, even if it neglected to find another role for Brie Larson, who is, in fact, America’s sweetheart. Anyway, 22 Jump Street should be great, so long as it turns sequels that rehash their predecessors into a meta joke. Also, less scenes of college parties and more scenes of Channing Tatum and Jonah Hill on drugs, please. This is the only movie on the list that is not adapted from previous source material. I have high hopes for Neighbors, as Seth Rogen can do no wrong in my eyes (although he didn’t write or direct this). Neighbors has a simple concept of class versus classless reminiscent of comedies from another era such as Animal House and Caddyshack, and it even promises Dave Franco doing an impression of Robert De Niro in Meet the Parents. The only issue is that the trailers may be giving away too much. I have a theory that bad comedies have good trailers, because all of their best material can fit into a two minute video. The best comedies save all of their gold for the theaters, which is partly why I liked last summer’s The Heat so much. Neighbors will be a great summer comedy, as long as the people who made it stop giving away all of its best f***ing jokes for free. I might be the only person on the planet who didn’t like last summer’s Pacific Rim, so I am in need of a movie where a giant dinosaur-type monster destroys an entire city. I think that Godzilla is that movie. The footage that has been shown to the world so far is nothing short of mesmerizing, and the entire film clocks in at just around the two hour mark. Finally, Hollywood is starting to trim down on its bloated spectacles. It has been almost a decade since the last Sin City came out, yet time has not weakened my excitement for another installment. A Dame to Kill For looks like it will provide all of the red blood against a black and white backdrop that I need for the year. The last film left most of the characters in a state that you wouldn’t necessarily call alive, so A Dame to Kill For will have plenty of room for new characters (though Mickey Rourke and Bruce Willis are coming back), situations, and decapitated clergymen. I don’t know a thing about Guardians of the Galaxy. I have no idea why Vin Diesel is playing a tree or why Bradley Cooper is playing a raccoon with a gun and I don’t care because I am into it. 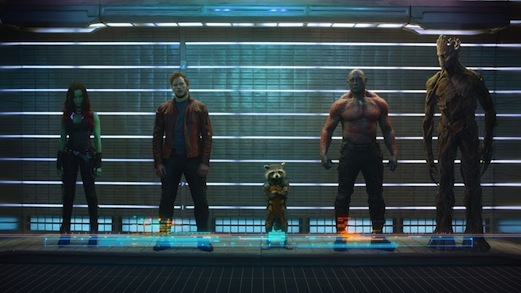 Guardians of the Galaxy looks like a refreshing break from most of today’s self-serious comic book blockbusters. It embraces a funny and silly spirit that will hopefully make this summer less cynical. The Guardians of the Galaxy trailer itself is a master class in how to make a good trailer: it tells you exactly what you need to know about the plot (a rag-tag team must save the galaxy) without revealing anything major (who are they fighting against?). Plus, between this and The Lego Movie, it looks like Chris Pratt is about to become a household name. Burt Macklin would be proud.